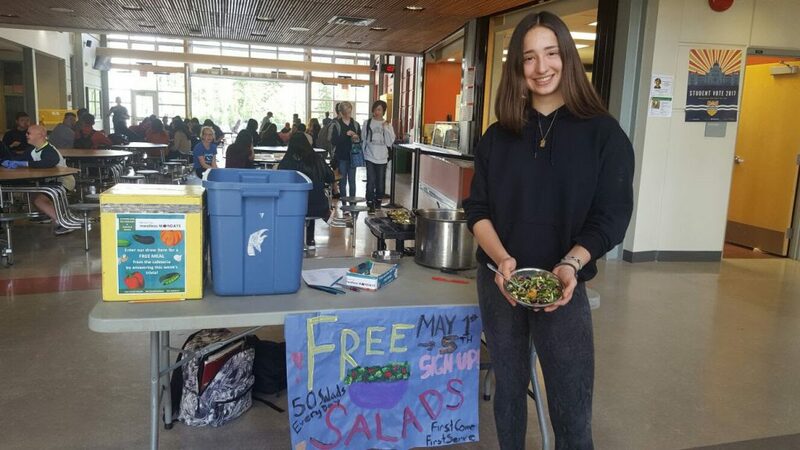 Sutherland Secondary’s Meatless Monday Club tabling for Meatless Monday and giving away free salads. In an effort to raise awareness of the links between diet and the environment, health and animal welfare, the Cities of Vancouver, New Westminster, North Vancouver and Port Moody have proclaimed today Meatless Monday. Students in Metro Vancouver are leading the way in introducing the concept, with a number of secondary and post-secondary schools offering plant-based meals in their food facilities on Mondays. To mark the occasion Vancouver Councillor Adriane Carr will visit David Thompson Secondary at 1755 E 55th Avenue at 11:30 a.m. to congratulate students and staff on the success of their Meatless Monday initiative. Here are a few photos from today’s media and outreach event at David Thompson Secondary! Eleven Metro Vancouver schools will be participating by offering at least one meatless dish on their menu in addition to their regular menu items. Two of these schools, Argyle Secondary and Lord Byng Secondary, are launching their initiatives today. The Carnegie Community Centre, which serves the Downtown Eastside, will be offering a special Meatless Monday menu today. The centre aims to offer healthy, culturally diverse and delicious food on a daily basis for the community. Meatless Monday is a global initiative, active in more than 30 countries and growing in popularity in Metro Vancouver. The campaign is aimed at increasing awareness about the impact of food choices and improving access to humane, healthy and sustainable food options. Reducing our overconsumption of animal products and increasing our consumption of plant-based foods helps fight climate change, protects individual/public health and reduces the demand for cheap meat that drives factory farming.